When Dianne Harris was 15 years old, she walked off the Alabama Lutheran campus with a group of 14 other students to join the student arm of the civil right's movement in Selma. The year was 1965. It was the first time Dianne had openly disobeyed any authority at school. "We wanted to be a part of the student movement and the student march and that was the only way that we saw fit to do that because our instructors and administrators - I think they were really trying to protect us from violence and that type of thing and they feared for our safety -but all the other students in the Selma city area were participating and we wanted to participate." Although Dianne will be the first to tell you that disobedience is never a good decision without due cause, she is happy she made the decision to leave campus that year. For about a week, Dianne and the other Alabama Lutheran students participated in nightly meetings at the historic Brown Chapel AME and daily marches. As a result, she was arrested twice and stuck in the arm with a cattle prod. Q. Did you encounter violence during the civil rights movement? Even though the school's administration did not openly support the movement, two professors from Alabama Lutheran were a part of the "Courageous Eight," a group of leaders in the Selma community that had been working for voter's rights for years. Dianne did not know Professors Gildersleeve and Blackmon were involved in the movement until they were announced one night at Brown Chapel. "I’m very proud to know and Concordia should be very proud as well and the Lutheran church as a body, that we had representation from two of our professors that we didn’t know about that had been making history for years and then the students finally came along," she says. A lifelong Lutheran, Dianne said one of the things she felt was most compelling about the movement was the integral part music played in lifting people's spirits, bonding participants together and providing courage and strength to continue. Every march was accompanied by freedom songs like, 'Ain't gonna let nobody turn me around," "Back of the Bus," and "We Shall Overcome." Q.) Can you tell us about the history of Concordia and the Civil Rights? Dianne says she is proud to know that many Lutherans, both white and black, participated in the movement. 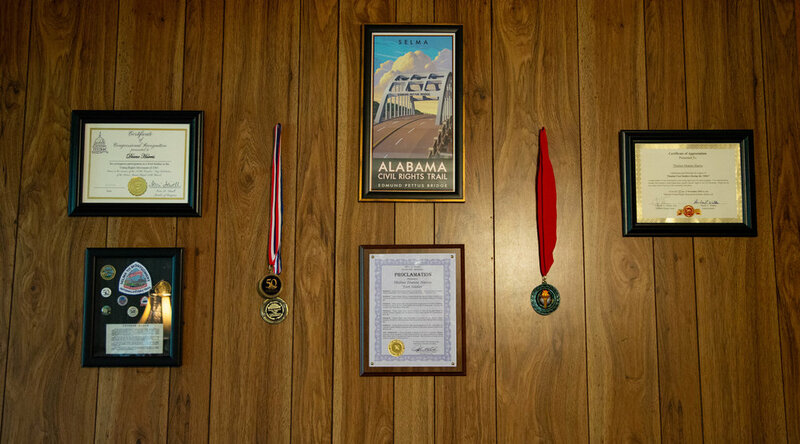 She is also proud of the achievements and advances Concordia College Alabama has made over the years. After retiring from teaching in the Selma school system after 27 years, Dianne went back to work as the assistant director of an after school care program at CCA for children of students. The program allowed for parents to attend afternoon and evening classes without having to pay for childcare. Although the program did a lot of good, it didn't continue past it's 4-year grant period. Afterwards, Dianne also worked as a tutor for CCA students. Sad to see the college close, Dianne hopes that stories both from the Civil Rights movement and from the history of Concordia College Alabama can be preserved for future generations.